This is the video that stirred people up most in 2018. How did it make you feel? Dr. Robin DiAngelo is Affiliate Faculty at the University of Washington. She is a two-time winner of the Student's Choice Award for Educator of the Year from the University of Washington’s School of Social Work. Her scholarship is in White Racial Identity and Race Relations. In addition to her academic work, Robin has extensive experience as a workplace consultant in race relations and racial justice. Her book White Fragility: Why It's So Hard For White People To Talk About Racism was released in June and debuted on the New York Times Bestseller list. ROBIN DIANGELO: All systems of oppression are highly adaptive, and they can adapt to challenges and incorporate them. They can allow for exceptions. And I think the most effective adaptation of the system of racism to the challenges of the civil rights movement was to reduce a racist to a very simple formula. A racist is an individual — always an individual, not a system — who consciously does not like people based on race — must be conscious — and who intentionally seeks to be mean to them. Individual, conscious, intent. And if that is MY definition of a racist, then your suggestion that anything I've said or done is racist or has a racist impact, I'm going to hear that as: you just said I was a bad person. You just put me over there in that category. And most of my bias anyway is unconscious. So I'm not intending, I'm not aware. So now I'm going to need to defend my moral character, and I will, and we've all seen it. It seems to be virtually impossible based on that definition for the average white person to look deeply at their socialization, to look at the inevitability of internalizing racist biases, developing racist patterns, and having investments in the system of racism — which is pretty comfortable for us and serves us really well. I think that definition of a racist, that either/or, what I call the good/bad binary is the root of virtually all white defensiveness on this topic because it makes it virtually impossible to talk to the average white person about the inevitable absorption of a racist world-view that we get by being literally swimming in racist water. 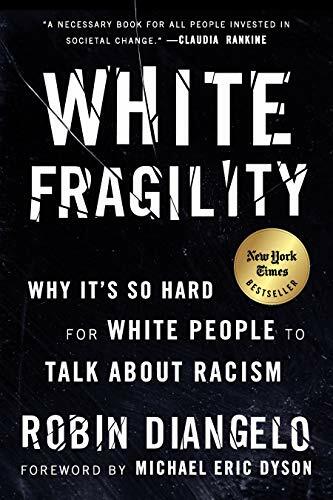 White fragility is meant to capture the defensiveness that so many white people display when our world views, our identities or our racial positions are challenged. And it's a very familiar dynamic. I think there's a reason that term resonated for so many people. I mean even if you yourself are to explain white fragility it's fairly recognizable that in general white people are really defensive when the topic is racism and when they are challenged racially or cross racially. So the fragility part is meant to capture how easy it is to trigger that defensiveness. For many white people the mere suggestion that being white has meaning will set us off. Another thing that will set us off is generalizing about white people. Right now I'm generalizing about white people, and that questions a very precious ideology, which is: most white people are raised to see ourselves as individuals. We don't like being generalized about. And yet social life is patterned and observable and predictable in describable ways. And while we are, of course, all unique individuals, we are also members of social groups. And that membership is profound. That membership matters. We can literally predict whether my mother and I were going to survive my birth and how long I'm going to live based on my race. We need to be willing to grapple with the collective experiences we have as a result of being members of a particular group that has profound meaning for our lives. We live in a society that is deeply separate and unequal by race. I think we all know that. How we would explain why that is might vary, but that it's separate and unequal is very, very clear. While we who are white tend to be fragile in that it doesn't take much to upset us around race, the impact of our response is not fragile at all. It's a kind of weaponized defensiveness, weaponized hurt feelings. And it functions really, really effectively to repel the challenge. As a white person I move through the world racially comfortable virtually 24/7. It is exceptional for me to be outside of my racial comfort zone, and most of my life I've been warned not to go outside my racial comfort zone. And so on the rare occasion when I am uncomfortable racially it's a kind of throwing off of my racial equilibrium, and I need to get back into that. And so I will do whatever it takes to repel the challenge and get back into it. And in that way I think white fragility functions as a kind of white racial bullying, to be frank. We make it so miserable for people of color to talk to us about our inevitable and often unaware racist patterns that we cannot help develop from being socialized into a culture in which racism is the bedrock and the foundation. We make it so miserable for them to talk to us about it that most of the time they don't, right? We just have to understand that most people of color that are working or living in primarily white environments take home way more daily slights and hurts and insults than they bother talking to us about. Because their experience is: they're going to risk more punishment. They're going to lose the relationship. They're going to have their experience minimized, explained away. They're going to cause the person to feel attacked or hurt. And in that way white fragility functions as a kind of everyday white racial control. None of that has to be intentional or conscious, but that is how it functions. And there's a question that's never failed me in my efforts to unpack, "How do we pull this off?" How do so many of us who are white individually feel so free of racism and yet we live in a society that is so profoundly separate and unequal by race? And the question that's never failed me is not, "Is this true or is this false, is this right or is this wrong," but: "How does it function? How do these narratives that I tell, how do they function?" When I tell you "Well, I'm just an individual. Why can't we all just be individuals?" When I tell you, "I was taught to treat everyone the same." When I tell you, "but it's focusing on race that divides us." When I tell you, "but I have lots of friends of color!" Those narratives have not changed our outcome, and they function to take race off the table and to exempt the person from any further engagement. And in doing that they function to protect the current racial hierarchy and the white position within it. It doesn't have to be what I'm intending to do, but it is the impact of those narratives. White guilt is a roadblock to equality, says Robin DiAngelo. It takes race conversations off the table and maintains the status quo. "How do so many of us who are white individually feel so free of racism and yet we live in a society that is so profoundly separate and unequal by race?" asks DiAngelo. Stop feeling bad—that's not productive. Instead, start doing something to dismantle the systemic racism that benefits you at the expense of others.